How can Michigan State University students quickly locate people on campus and beyond? I conceptualized, tested, and iterated a mobile app concept that provided a solution. Jimmy leaves class one cold morning knowing he needs to finish some homework before his next class. His usual study spots – the Union and the library – are far away. Besides, the library is usually too crowded and the Union tends to be too loud for him to get anything done. Jimmy wants to return to his dorm to work at his desk, but he knows if his annoying roommate Mike is there, it will be even harder to do any work than it would be even at the Union or library. Jimmy doesn’t want to walk through the cold to his dorm to find out in person whether or not Mike is there. He also doesn’t want to call or text his roommate to find out where he is because that would be awkward. 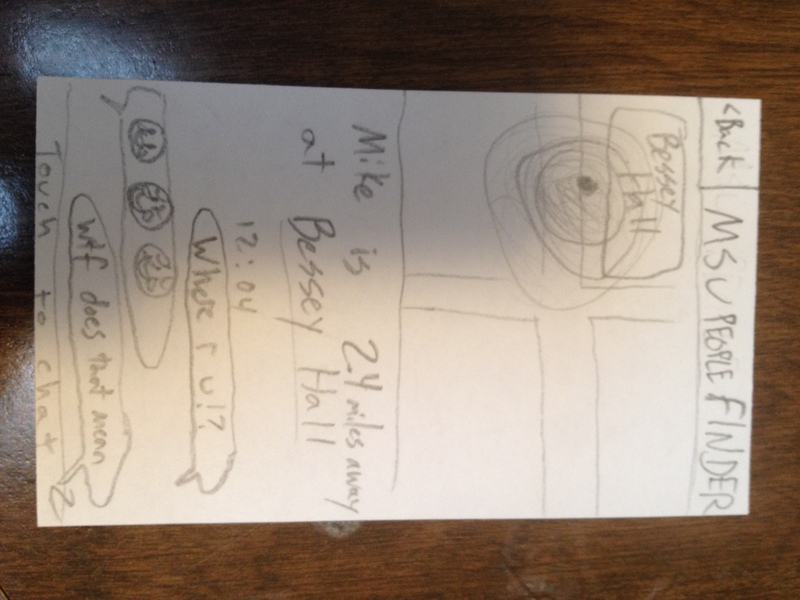 Instead, Jimmy opens up the MSU People Finder app to check Mike’s location. Thankfully, Mike is all the way across campus doing God knows what. Who cares, anyway? Jimmy starts heading home, smiling with the knowledge that he’ll be undistracted in his dorm. 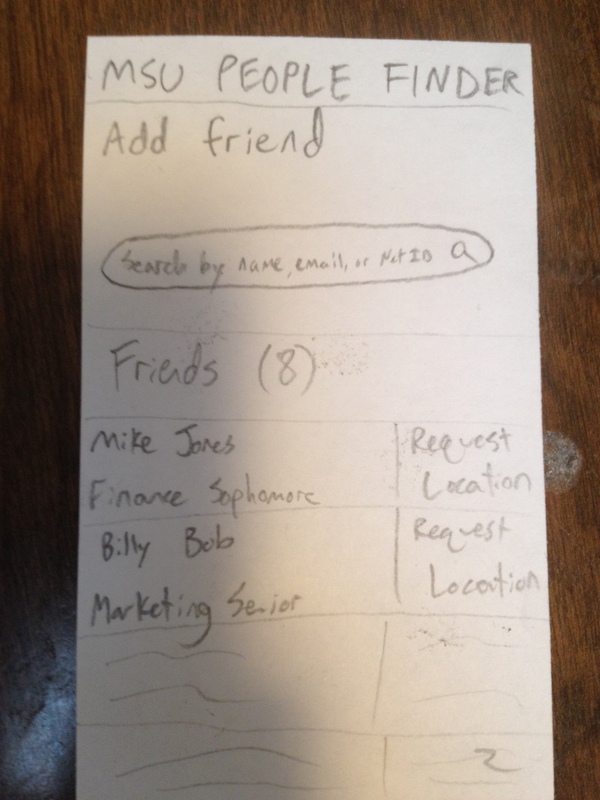 With that story in mind, I began sketching my first ideas for the app’s interface. 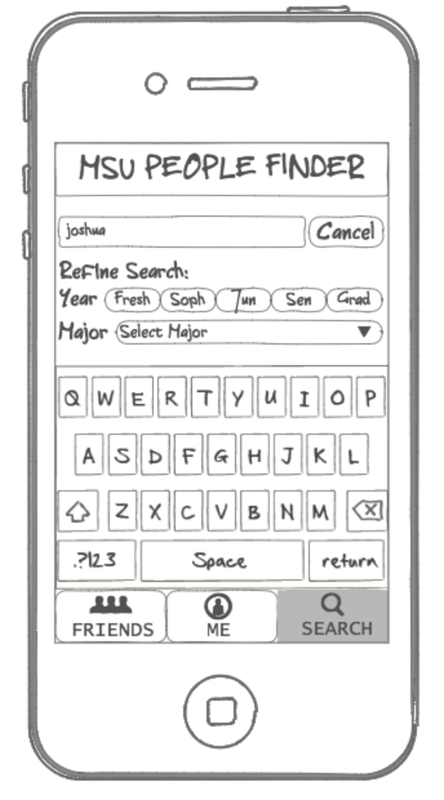 With only a few minutes to write out my thoughts, I envisioned a search bar with filtering options (by year, major) that would reveal a list of MSU students. Next to each of their names would be a large “Locate” button. Pressing that button would lead to an MSU campus map and a marker showing where the person was. 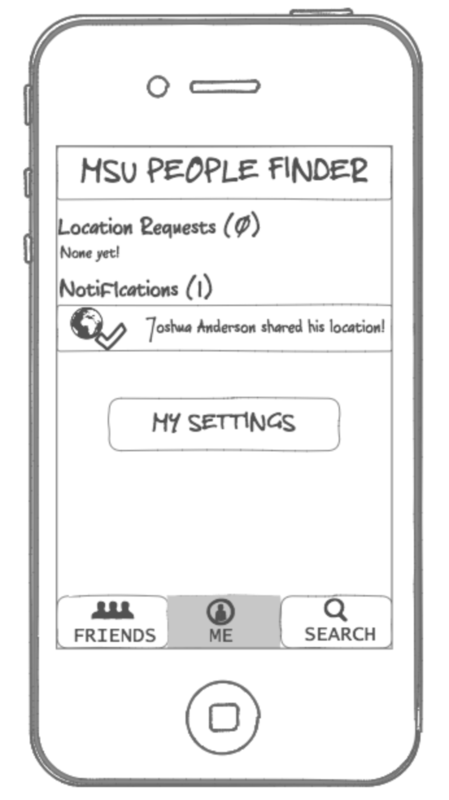 Privacy-conscious users would also have the option to disable their location, as shown by the option next to the second person. Now, users would need to mutually add each other as friends before they could exchange information (similar to how Facebook operates). 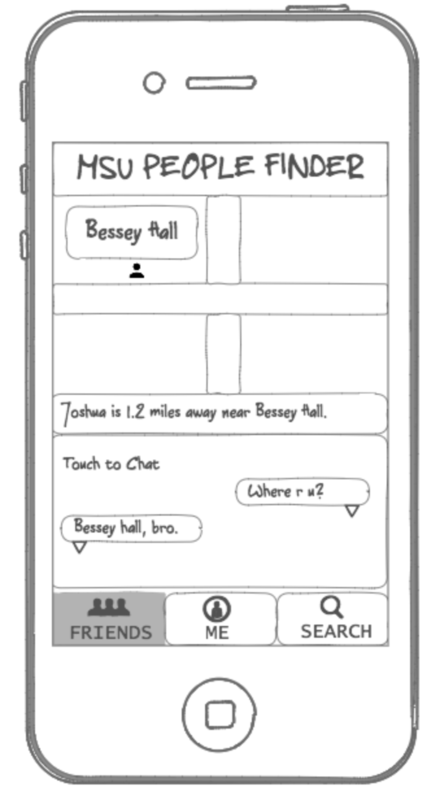 Users could only request the locations of those with whom they were friends. Iterations 1 and 2 were completed under a strict time limit (10 minutes, give or take). I was allowed to take my time on the third iteration, however. I drew every screen I would need to show a full interaction with the app. 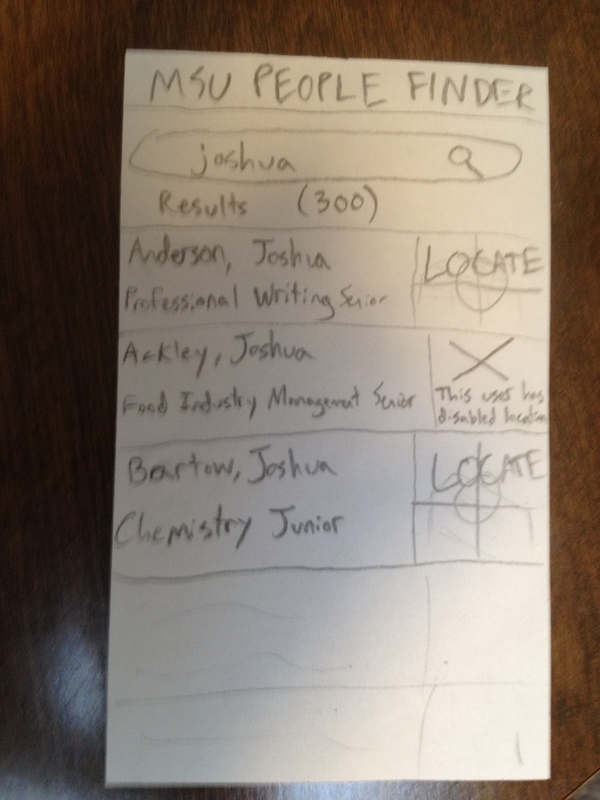 This included the home screen (with and without notifications), and a more realistic search progression. In the video, the questions I ask my research participant are left-aligned in white, and her answers are right-aligned in yellow. The questions I asked guided my research participant down a path slightly different than the one laid out in my original scenario, but the general task (Can you find a specific person?) was the same. 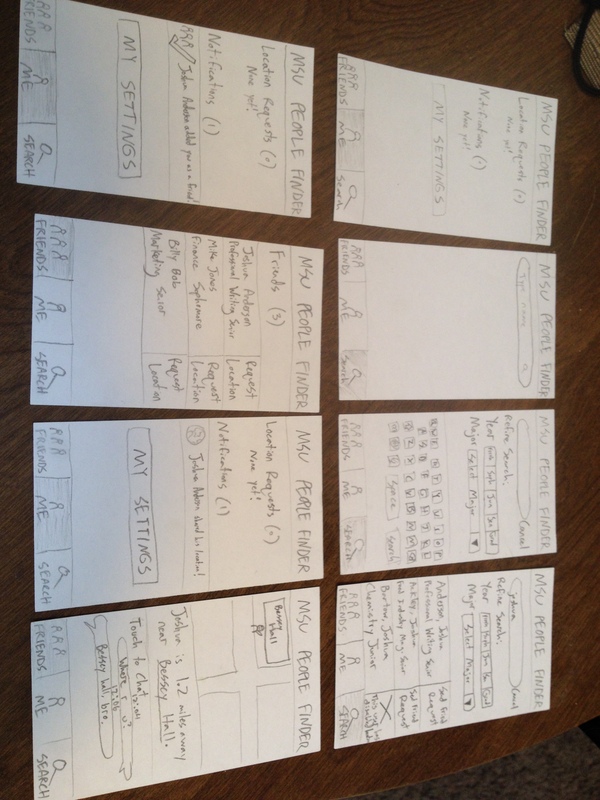 Finally, I recreated my user research session in the wireframe version of my app. While it was difficult to draw the first iterations of my app in such a brief amount of time, I was pleasantly surprised by how much I was able to design under pressure. The feedback I received immediately after my hasty first iteration proved especially valuable, and prevented me from spending a longer time drawing features of my app that were doomed to be cut. Thus, I gained a newfound appreciation for rapid prototyping. I also learned the value of presenting user research results via video – even if that video is rough. By creating a brief but eventful video, I could illustrate my user’s interaction with my app in a concise (and maybe even entertaining) way. I knew that Ninjamock was a quality tool before this project, but now I know that paper prototyping can also be an effective way to sketch, test, and refine my ideas. 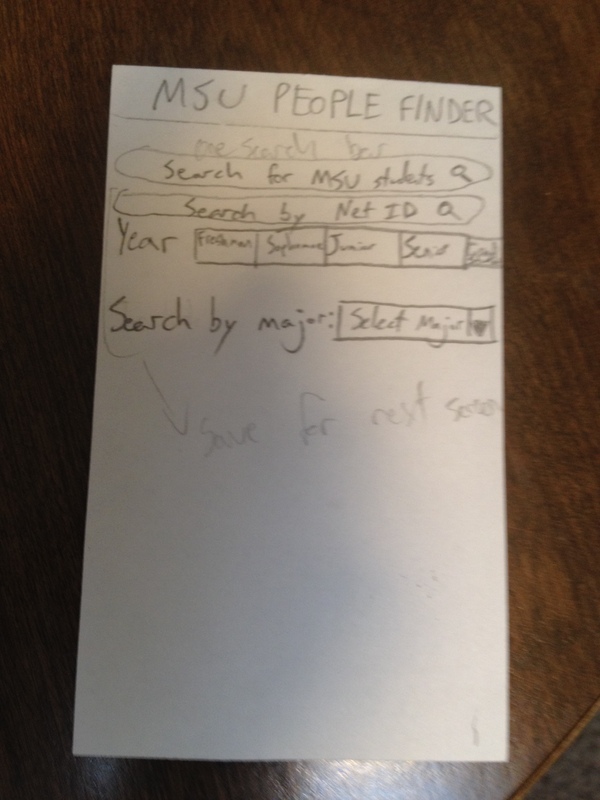 I have no plans for further developing the MSU People Finder app idea, but the process proved useful and educational nonetheless.